The Nairobi Region Research Club of Africa (R.C.A) competitions were held on Saturday, 18th March 2017 at State House Girls High School, Nairobi. Strathmore School was represented by 20 students drawn from The Research Club. They were led by their Club Patron Mr. Kerongo. This year, the theme was “Citizenship” and the Strathmore School sub-theme was “Community Service”. The main objective was “How community service makes a student a good citizen”. It was a good and relevant exercise for a Strathmore student to research on a topic of an activity in which their F2 & F3 students participate during April, August & December holidays. The presenters had SMART objectives and were able to answer good questions from the audience. 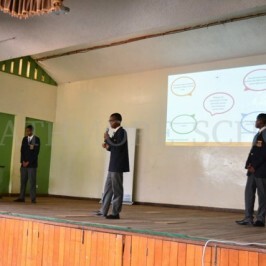 The presenters were: Kanyua Waweru (F3 Alpha), Sifa Irungu (F3 Alpha), Storm Gachoki (F3 Alpha) and Kalya Tuwei (F1 A). The other schools were the hosts State House Girls, Lenana School, Moi Girls Nairobi, Alliance Boys, Corner Brook from Juja and Makongeni School. Strathmore School competed well and garnered 70 points out of 100 and emerged position 4 out of the 7 schools that participated in the event. Congratulations to the Research Club!